Caring for an elderly parent, grandparent, neighbor or other loved one can be a stressful and tiring experience. If you are worried about what will happen to your loved one in the event of a fall, accident or other household emergency you should understand the benefits of a Safety Monitoring system. 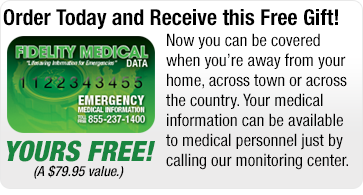 Whether you live close by or across the country, you can get peace of mind knowing that with a Emergency Response USA, help for your loved one is available 24 hours a day 7 days a week with just the press of a button. According to a recent AARP Survey, over 90% of seniors said it was “extremely or very important for them to stay at home as long as possible.” With simple installation and a cost of less than $1 per day, a Safety Monitoring system is one of the easiest and most cost effective ways to make this desire a reality. Accidents are a top cause of death and disability for seniors, particularly those living alone. While Safety Monitoring systems cannot prevent accidents, they can greatly minimize the effect by enabling a quick response from neighbors and EMS. Despite the seemingly obvious benefits of Safety Monitoring systems, some seniors are wary of any changes to their home environment. If your loved one is reluctant to wear a Safety Monitoring button, we have tips on persuading your loved one to use a Safety Monitoring system. No matter how much a senior may think they don’t want a Safety Monitoring system, they will almost always prefer it to the alternative of needing to move out of their home. While a Safety Monitoring system is a critical part of any senior safety plan, it is by no means the only tool at your disposal. There are many products available to aid in senior mobility and safety. Be aware and ready to recommend the use of a walker, a cane, a scooter, or bed rails. In addition, there are a lot of safety tips that a caregiver can recommend that are free or low cost and easy to implement. At Emergency Response USA we want to help seniors live safely and independently in the comfort of their own homes for as long as possible. Emergency Response USA operates in all 50 states (and Canada), so all seniors can be served. Contact us today to find out how a senior Safety Monitoring system can help while providing seniors and their caregivers with peace of mind.